Lifestyle January 10, 2017 January 10, 2017 by Lady V.
It’s Tuesday — and that means tacos! 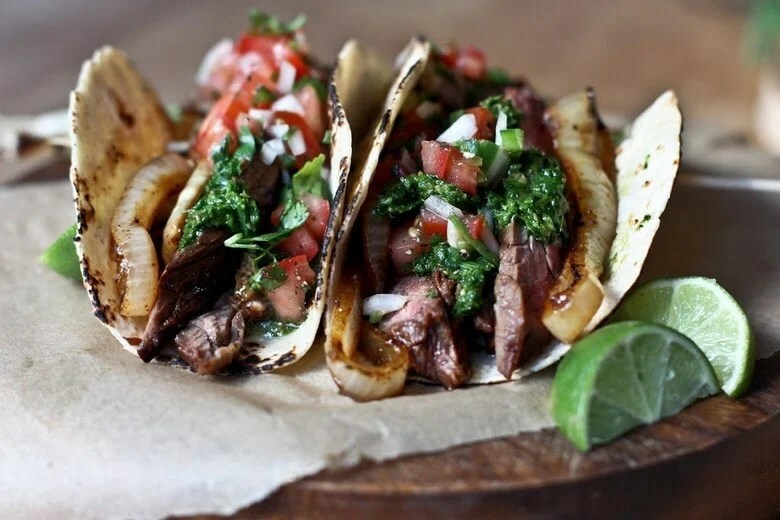 If you want to spice up your Tuesday night and bring some taco-awesomeness into your life, then check out these amazing gourmet taco recipes from around the globe. Better yet? This one’s a COMPETITION! Read on and discover how you can win a chance to be featured on Lady Vivra! Want to be featured on Lady Vivra? Simply reply below with your favorite Taco Tuesday recipe and you could win a chance to be featured next week! Winners will be chosen on Sunday. What? These tacos are beautiful and bougie in one shot. An absolute feast for the eyes (as well as the stomach), these tacos feature jeweled grapefruit-pomegranate salsa, flecks of cotija cheese, chipotle greek yogurt crema, and lightly fried fish. I mean…what’s not to love? With the perfect colors of the winter season, these are sure to be a quick favorite. Get the recipe here. Those familiar with Mexican street food will recognize these yummy dummies right away. Though these might look ridiculously simple, they actually require the work of a practiced hands. Prep is a little involved and requires the limes to be rolled carefully over the counter before squeezing and using tender cilantro stems for an extra-flavorful crunch. To make this recipe even better? Marinate the beef ahead of time. Sound good? Does anyone else hear Gordon Ramsey’s voice yelling insults at them from the background? East meets west in this delicious recipe. Banh Mì is a traditional Vietnamese sandwich that is very popular in its land of origin. And, when you think about it, the same is kind of true of tacos in the US. (They are kind of like a sandwich, though, aren’t they?) So it only makes sense that the two would come together to make a totally delicious new gourmet concoction. All you’ll need is a bit of pork pate, Kewpie mayo, pulled pork, pickled daikon, carrots, jalapeños, cilantro lime and Sriracha sauce. And, believe me, it is WELL worth it! Mixing zesty grilled shrimp with an out-of-this-world cheesy salsa and summer fruits is the perfect way to bring big flavor to your Taco Tuesday dinner plans. Even better? This recipe is incredibly easy to make and the fresh fruit will bring a smile to your guests’ faces. This recipe is so good you’ll have to go back for seconds and thirds. Those tender poblano peppers will melt in your mouth and the smoky grilled corn and crisp red onions will take you to another level. Instead of the salad, try a making a salsa by adding more lime. Vegetarian or not, you will not want to stop eating these incredible tacos. Think this southwestern treat is only for supper? Wrong! Turn your favorite chocolate cookie into a taco shell then load it with strawberries and cream. Result? This amazingly decadent dessert. Okay, okay. I know. But stay with me, here. Filled with rajas poblanos and nopal cactus, this recipe calls for authentic preparation. That goes doubly for the cashew chipotle and salsa verde topping. If you’re looking for a genuine gourmet taco experience, this is it. If you thought east could only meet west in the previous Vietnamese recipe, think again. You won’t be able to stop gushing about this yummy concoction. Ridiculously filling and even more ridiculously delicious, the tandoori chicken and traditional taco-ness are perfect compliments of one another. Try it as tapas or eat it as a meal. Rounding off my list of this week’s gourmet taco picks is none other than this crunchy kale mix-up. Hear me out, this may not be the first choice of gourmet dishes, but this recipe is packed full of flavor and is perfect for those who committed to cutting down the pounds in the new year. By replacing the carb-heavy tortilla with kale, you’ve already cut your calories in 1/2. Next, the crunchy green shell is filled with a tasty carrot and ginger spread that is especially great for the vegans in the audience. So, if you need your taco fix but want a smaller belly — try these green and vegan friendly tacos. You won’t be disappointed. And there you are! This week’s picks for the best gourmet Taco Tuesday recipes. Don’t settle for a boring dinner. Try something new and dive into one of these great recipes right away! What is your favorite Taco Tuesday recipe? Let me know in the replies below! The best recipes will be featured on Lady Vivra’s Facebook, Twitter and Instagram accounts next week!